3) Better terms of trade. Now many voters, going down the list, will promptly put a checkmark by one or two of the items, and some (especially Trump’s base) will check all three. But let’s think about the combination. Here we are, the wealthiest country ever, clamoring for more, more, more – with an insatiable appetite for global resources – while letting fewer and fewer people into the country to enjoy the bounty. All while releasing more pollutants into the global environment and demanding more favorable trade. How would you describe such a policy? What adjectives would you use? If you’re living in most parts of the world, “frustrating” might come to mind. For Americans who care about our standing in the world, it might be “embarrassing.” And these are mild adjectives; “threatening” and “dangerous,” respectively, might be more telling. No matter where you are or where your patriotism lies, it cannot be denied that Trump’s national security strategy is utterly greedy. We haven’t seen the likes since President George H.W. Bush announced “the American way of life is not up for negotiation” before the 1992 Earth Summit. But Trump’s strategy is far more sweeping, imbuing greed into a comprehensive framework of domestic and foreign policy. Nothing could be more threatening to national security than having the rest of the world view you like a greedy pig at the global trough. That’s why Trump’s strategy may go down as the biggest foreign policy blunder in history. Is there a silver lining? Perhaps, if it causes enough reflection upon the components of Trump’s strategy. The fact is, each of the components – tightened borders, growing GDP, better terms of trade – have their time and place. But how should these components be viewed by the richest nation during the early 21st century, with poverty suffocating many nations and environmental crises brewing globally? I think the answer is fairly simple. To start with, we know that GDP growth cannot continue ad infinitum. We also know that, long before GDP stops growing, the increasingly desperate efforts to stimulate growth become more harmful than the growth is worth. This isn’t the 19th century with an open frontier to develop. At this point in history, oil spills, resource conflicts, and the extinction of species tend to outweigh marginal increases in GDP. Although the limits to GDP growth cannot be thoroughly understood without a global perspective, it’s also clear that every nation has its own limits. Even for the nation that intends to invade others, eventually there’s no more “lebensraum.” In the 21st century, there’s basically no more “living room” to be peacefully taken. Grabbing more of it is tantamount to war. It seems, then, that the more prudent approach to national security is adopting a steady state economy. This entails stabilizing the levels of production, consumption, and expenditure. Basically, it entails stabilizing rather than growing the GDP. And no it’s not stagnation: plenty of technological, financial, diplomatic, and national security dynamics occur in a steady state economy. Of course, if the population is still growing in a steady state economy, then per person GDP declines. In other words, wages decrease and unemployment increases. In such an environment, the public sector – including defense – is every bit as endangered as the private sector. There’s nothing secure about that, either. Therefore, population stabilization is crucial for national security. So we get to the issue of borders, which have to be tightened for the sake of stabilizing population. It’s hard to make friends and influence people while tightening borders, but there’s a big difference between respectful non-friends and angry, motivated enemies. The nation that announces the goal of a steady state economy has instant ethical credibility for tightening borders. The steady-state nation will garner respect in the international community, even if that respect comes somewhat grudgingly. It certainly will be far more secure than greedy nations that push their way into the cupboards of others. Greedy nations get their hands slapped at the UN and, if they persist in grabbing, start losing fingers outside the UN. Finally, the steady-state nation provides crucial leadership in 21st century diplomacy. If a strong, wealthy nation such as the United States leads the way, others will follow suit. It is not difficult to conceive of a rock-solid alliance of steady-state nations that protect one another from the grabby advances of growth-mongering nations. Meanwhile, nations with widespread poverty will finally have some breathing room. The outside demand for their natural resources will slacken palpably. Their attentions can be focused on their own economic development, and fewer of their citizens will become radicalized and retaliatory. At that point in history, those nations that persist in their pursuit of rampant growth – especially those already having substantial wealth and power – will become the most isolated, castigated, and insecure nations on the planet. Let’s hope and pray the United States isn’t one of them. Unfortunately, it will be if Trump succeeds in making America greedy again. Thanks for such an excellent perspective. The reality of achieving a sustainable culture of living on Planet Earth is especially difficult for the USA when it is already consuming three times as much of its share of the world’s sustainable resource. Our species is racing towards a catastrophe and our leaders must take responsibility for creating the climate of opinion that will allow the impact of the catastrophe to be somewhat reduced ,otherwise civilisation is heading for a Hi Tech version of 1984. *Our main problem is that we don’t have a “leader.” We have a wannabe dictator who is following Hitler’s plan to a great degree. He has appointed toadies who are deliberately destroying all the gains this nation has made as a Constitutional Republic. In essence, we have devolved into the Fourth Reich. *Forbidden words? Prison sentences for disagreeing with government policy? Police killing, macing, kettling and removing protestors to remote locations? Giving our means of communication, the internet, to the giants that control almost all of the wave of propaganda we now get through “Faux news” and other controlled agencies. Destroying parks and monuments, set up to preserve at least some of our history and ecology, turning them over to drilling and mining? Exchanging diplomacy and reason for tanks, guns, drones and missiles. Utter contempt for not only our people and their wishes, but for the whole world. *The situation reminds me of 1939, when Chamberlain give Czechoslovakia to Hitler and returned saying “There will be peace in our time.” Shortly afterward, Hitler blitzkrieged Poland and it took a generation of almost the whole world to defeat him. *Our dictator is fascinated with the idea of a nuclear war, and seems to be doing anything he can to force it on North Korea. *I am a nuclear veteran and have seen and felt what these lunatics so casually talk about visiting, again, upon the world. I survived, a lot didn’t. *If we don’t take the nation back from these greedy lunatics, Civilization as we know it will no longer exist. The nuclear winter following it will probably make us virtually extinct, along with most of he rest of life on earth. Trump may be mad, misogynist, racist, clown, but the USA is no fourth reich. I am german, and I find this assumption diminishes the true scope of what nazi terror has been about. The USA still has a civic tradition that can and will overcome Trump. Germany under Hitler had lost that. The truth that americans have to swallow is, that this Presidents policy is only very slightly more crazy, greedy, bellicose and tyrannical than the previous presidents policies have been. There is only one great difference: The true face of neoliberal politics, as invented 1973 by Friedmanns Chicago boys in Chile after toppling Salvador Allende, is now showing itself in its mother country, the USA. With Trump, this vicious form of neoliberalism that coined the term for all its critics worldwide, is truly “coming home”. Trump is doing exactly the same things that the ruthless dictators, (Suharto, Pinochet, the Saudi Kings, The Iran Shah Pahlavi, the Kabilas …), installed by the USA to enforce neoliberal politics, have done over the last 45 Years. If he can, if nobody stops him, Trump will do away with any workers or left resistance, with free press, with environmental protection and the last remnants of social equality, welfare and democracy, just as the US by proxy of the World Bank and the IMF did in the developing world since the 70s. Denouncing Trump as a fascist is way too simplistic and is a way to excuse the american voter from the results of their blind ignorance and mute acceptance of US foreign affairs and political economy. The truth is, that Trumps stands exactly what the US stood for, for everybody outside its borders since the seventies. This truth of course might be pretty hard to swallow for those that still believe in the narrative of “the home of the brave and the land of the free”. To accept Trump as the first President that drops its Janus mask and shows the true face of US-politics to its own people will be a hard lesson to learn for those US citizens who still believe that the USA is a force of good in the world. It is so much easier to dismiss Trump as a fascist than to look into a mirror, and to find out that the face of the Donald stares back at you. 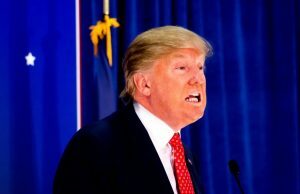 Trump, Trumpism and whether USA is or isn’t facist yet – yawn. Meanwhile, someone’s creating answers that work despite the current situation. Let’s find them, or make them.